Common Disturbing Neck Pain Symptoms & Conditions That Can Linger, Becoming A Chronic Pain Issue & May Involve Dizziness, Memory Problems & More. Chronic neck pain is an issue that is difficult to treat, sometime requiring surgery. It is often very frustrating to deal with chronic neck related problems because they can be resistant to treatment and may involve symptoms such as irritability, dizziness, memory problems as well as eye problems, which are some common disturbing neck pain symptoms. These disturbing neck pain symptoms may be related to more well known conditions like chronic whiplash injuries, but may involve other conditions such as concussions and vascular problems. We have discussed some conditions like whiplash or neck sprain/strain injury, disc problems, joint problems and degeneration or arthritis. Lets revisit one briefly and look at some other conditions that can have some common disturbing neck pain symptoms. The table below shows common symptoms of these conditions and we will discuss these below the table. P = Present Symptom. Chronic = pain or symptoms lasting 6 months and more. Parasthesia = symptoms like tingling or numbness. Dysphagia = problems swallowing. Suboccipital headaches = pain at the base of the skull. Cranial nerve symptoms = 12 cranial nerves producing many neurological symptoms like Bell’s Palsy or related to the face. This refers to problems with the first two bones (vertebrae) of the neck (cervical spine). Much of the head rotation comes from these two bones, the top of which connects to the skull. Instability can be from accidents which damage the ligaments or structures in this area. It is also a feature of rheumatoid arthritis in the cervical spine and down’s syndrome. Injury to the ligaments of these bones from neck or head trauma, even though not visible on x-rays, are more frequent than bone fractures or dislocations, which are usually easy to discover on x-rays. If there is laxity of the ligaments around the atlanto-axial areas, rotation or turning of the head is the major cause, especially side bending with rotation. Almost 25% of damage seen with more severe neck injuries, mostly involving rotation, are due to just the ligaments. Some atlanto-axial ligament injuries produce enough instability to cause severe neurological problems; part of the brain stem and the spinal cord is in this area. 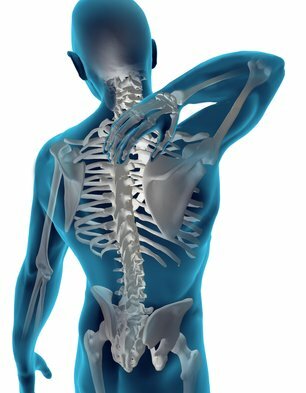 However, as in early stages of rheumatoid arthritis, most problems arrise from damage that is below the threshold of these severe symptoms to the joints and ligaments in this region of the cervical spine, and a major cause of chronic neck pain symptoms from traumatic injury. The upper area of the cervical spine is very mobile, however, it comes at a price – lack of stability. The atlanto-axial area is prone to injury. The ligaments forming the capsule of the joints help to provide stability and are particularly prone to injury, especially when rotation of the head is involved. Too much tension on the joint capsule and cause stretching or tearing leading to a type of instability, thus causing neck pain. These joint capsules become stressed from awkwardly sustained neck postures like forward head posture and can deform up to 70% beyond the normal range. This can cause permanent stretching as they become loose, allowing abnormal motions and resulting pain syndromes. This can lead to early or more significant degenerative changes with disturbing neck pain symptoms. Ligaments in the cervical spine are often damaged during a car collision, sports injuries or falls, resulting in a whiplash type injury to the neck. Injuries to the capsular ligaments of the facet joints are difficult to diagnose, leaving the condition untreated to become a chronic neck condition. Often, these facet joint syndromes can be mistaken for a herniated disc. Long term symptoms often involve neck pain, various headache symptoms, vertigo, dizziness and referred pain to the arms, similar to that of a pinched nerve from a bulging or herniated disc. There is an association between chronic neck pain experienced by some whiplash sufferers and damage to ligaments and facet joints as indicated by nerve blocks and destroying the nerves of the joints resulting in relief. A growing interest has been seen in whiplash patients that have not achieved relief from traditional therapies and damage to these capsular ligaments and their associated facet joints. Many scientific studies indicate the facet joints and surrounding ligamentous capsules as a main site of injury to the neck during whiplash trauma and can be responsible for ongoing, chronic symptoms, possibly related to the instability created by damage to these structures. 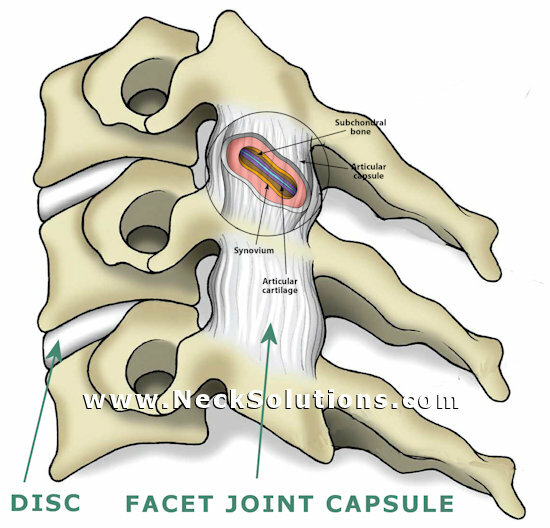 There is greater forces placed on the capsule ligaments than the disc, about 10 times as much, because they are smaller. The stretching involved in these injuries effects spinal motion and can ultimately lead to disc degeneration and arthritis in the facet joints. Through simulated whiplash crash testing, it has been shown that these joints are under extreme strain, especially when the head is bent and/or rotated, which leaves them more vulnerable than when the head is straight. When the head is turned, the forces to the facet joints and capsular ligaments increases almost 35%. This increases the more the head is turned, with some studies indicate much higher forces placing extreme strain on the joints. When the head is turned to the right, it is the right facet joint and capsule that is vulnerable. That is why many doctors will ask if your head was turned during the accident. It matters and may correlate with the side of pain and/or symptoms. Almost 2 million people are diagnosed as having a TBI (traumatic brain injury) every year in the US. This figure could be higher considering many will not seek medical care and go undiagnosed. Most of TBI’s are concussions, which are considered a mild form of TBI. Nonetheless, concussions can cause short or long term physical, emotional and cognitive symptoms as well as disturbances with the sleep cycle. A diagnosis of concussion involves memory loss just before or following injury, loss of consciousness, mental status alterations and neurological problems. Most people recovery from concussions, but about 30% will have ongoing symptoms like neck pain, memory problems, headaches and dizziness a year after injury. These symptoms after concussion are called post concussion syndrome (PCS). These symptoms, similar to chronic whiplash or whiplash associated disorders (WAD) may result from injury to the ligaments producing an instability of the cervical spine. Many of the symptoms of post concussion syndrome are common to whiplash associated disorders. Post concussion syndrome is diagnosed when 3 of the 8 symptoms appear within 4 weeks: problems dealing with stress, memory difficulties, problems concentrating, sleep problems, irritability, dizziness, fatigue, and headaches. Also common to whiplash disorders is the fact that the severity of initial injury is not necessarily related to extent of symptoms, where a low speed auto accident or fairly light head trauma can result in significant symptoms, where higher forces may result in lesser symptoms. The similarity of chronic disturbing neck pain symptoms could be related to injury to the ligaments in the neck, technically a sprain. Chronic neck pain can result from both whiplash and concussion injuries. The common factor may be related specifically to the capsular ligaments that surround the facet joints in the neck, resulting in ligament injury (sprain), producing loosening or laxity of the ligaments and instability of the atlanto-axial area of the upper cervical spine. This is a term many are unfamiliar with, however, the upper cervical spine has arteries that run through them. In this region of the neck, the arteries go through holes in the bones called transverse foramina and they are subject to pressure from the way the bones move and the way the arteries course through the bones. It is not a straight path like the lower part of the cervical spine. This allows motion without narrowing or pinching the arteries to maintain proper blood flow. The video shows how the arteries move with head motion. Even with normal movements like rotating the head, it is possible to pinch off blood flow to one of the arteries up to 30%. The narrowing of these arteries can be to a greater extent with degenerative changes like outgrowths of bones called bone spurs or osteophytes. The vertebrobasilar arteries go through the vertebrae (spinal bones) and into the head to supply the back half of the brain. When the blood flow to these arteries is restricted, it is called vertebrobasilr insufficiency (VBI), and this may result in very disturbing neck pain symptoms like headaches, neck pain, vertigo, drop attacks, dizziness, visual and hearing problems, and problems with speaking and swallowing. Most often, vertebrobasilar insufficiency is caused by degenerative cervical spondylosis or atherosclerosis. Symptoms may be produced with extreme turning or tilting back of the head, which compresses the arteries. Whiplash injuries can produce these extreme motions and whiplash symptoms like dizziness and vertigo can be related to problems with these arteries. It is also possible that instability from damaged capsular ligaments may cause vertebrobasilar insufficiency from instability during head rotation. Barre Lieou syndrome is a cause of neck pain named after two individuals that described this syndrome that causes pressure or pain around the eye, headache, tearing, facial discoloration and other symptoms related to blood vessels and nerves. It is a disorder of the posterior cervical sympathetic nerves and therefore also called posterior cervical syndrome. It may be due to cervical arthritis or an injury which irritates vertebral and sympathetic nerves located in front of the neck bones. Symptoms rleated to Barre Lieou syndrome may arrise following trauma. The symptoms are also common to whiplash and post concussion syndrome and can make for a difficult diagnosis. Common Disturbing Neck Pain Symptoms & Conditions – What To Do? It is always important to get a proper diagnosis. These disturbing neck pain symptoms can arise from other causes than noted here, but diagnosing the condition is important before treatment. Surgery may be indicated. Special medications to help prevent bone destruction in cases of rheumatoid arthritis may be needed. For persistent symptoms where surgery and special medications are not indicated and standard medical treatments fail to resolve symptoms, conservative therapies are often tried. Physical therapy and massage may help alleviate symptoms. Chiropractic care may be tried, although, a specialist in the upper cervical spine like NUCCA, that use low force techniques is one of my favorites due to the important nature of this region of the spine. One form of therapy is called prolotherapy. It is a type of regenerative medicine. Since these conditions often display signs of ligament stretching or damage, prolotherapy seeks to repair the ligaments by using repeated injections of a sugar solution which is thought to stimulate repair of these tissues, tightening up the ligaments. With the advent of biological therapies like stem cells, prolotherapy may show a promising future and has provided some with relief for disturbing neck pain symptoms when other methods have failed. Learn more here. And you can search for “Regenerative Medicine Clinics” in your area for treatments like stem cell therapy, PRP injections and prolotherapy.